Alan Pollock’s touching love story is set against a background of conspiracy. It is the Autumn of 1940 and Katie, a young Coventry clerk, waits on the station platform in Henley in Arden, Warwickshire. There she meets Michael, a language don working as a code-breaker at Bletchley Park. As their romance deepens, Michael is secretive about his work. 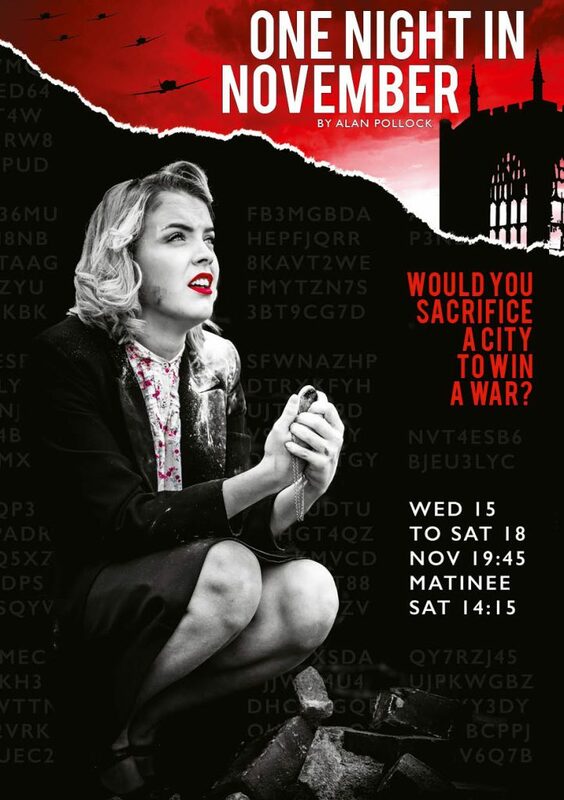 But when he and a colleague work on deciphering a coded enemy message and deduce that Coventry is to be attacked and pounded into rubble, he faces an agonising dilemma. Should he warn Katie and her family about the impending raid, risking disgrace and prosecution under the official secrets act ? Guildburys were thrilled to welcome the playwright, Alan Pollock to the Friday evening performance of his play. Photography and graphic design Phill Griffith. Click on the video to see the production images.